Evacuated tube collectors are made of a series of modular tubes, mounted in parallel, whose number can be added to or reduced as hot water delivery needs change. This type of collector consists of rows of parallel transparent glass tubes, each of which contains an absorber tube (in place of the absorber plate to which metal tubes are attached in a flat-plate collector). In some cases, the tubes are covered with a special light-modulating coating. In an evacuated tube collector, sunlight passing through an outer glass tube heats the absorber tube contained within it. The absorber can either consist of copper (glass-metal) or specially-coated glass tubing (glass-glass). The glass-metal evacuated tubes are typically sealed at the manifold end, and the absorber is actually sealed in the vacuum, thus the fact that the absorber and heat pipe are dissimilar metals creates no corrosion problems. Some systems use foam insulation in the manifold. Soda-lime glass is used in the higher quality evacuated tubes manufacture. Later technology evacuated tube systems use the glass coated absorber. The glass is a boron silicate material and the aluminum absorber and copper heat pipe are slid down inside the open top end of the tube. In lower quality systems moisture can enter the manifold around the sheet metal casing is eventually absorbed by the glass fibre insulation and then finds its way down into the tubes. This leads to corrosion at the absorber/heat pipe interface area, also freeze ruptures of the tube itself if the tube fills sufficiently with water. Two types of tube collectors are distinguished by their heat transfer method: the simplest pumps a heat transfer fluid (water or antifreeze) through a U-shaped copper tube placed in each of the glass collector tubes. The second type uses a sealed heat pipe that contains a liquid that vapourises as it is heated. The vapour rises to a heat-transfer bulb that is positioned outside the collector tube in a pipe through which a second heat transfer liquid (the water or antifreeze) is pumped. For both types, the heated liquid then circulates through a heat exchanger and gives off its heat to water that is stored in a storage tank (which itself may be kept warm partially by sunlight). Evacuated tube collectors heat to higher temperatures, with some models providing considerably more solar yield per square metre than flat panels. However, they are more expensive than flat panels, but generally of a less cost to repair in the event of damage. 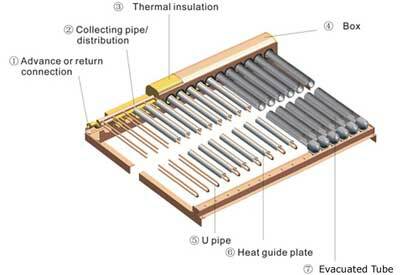 Evacuated heat tubes perform better than flat plate collectors in cold climates because they only rely on the light they receive and not the outside temperature.The high stagnation temperatures can cause antifreeze to break down, so careful consideration must be used if selecting this type of system in temperate climates.Tubes come in different levels of quality so the different kinds have to be examined as well. High quality units can efficiently absorb diffuse solar radiation present in cloudy conditions and are unaffected by wind. 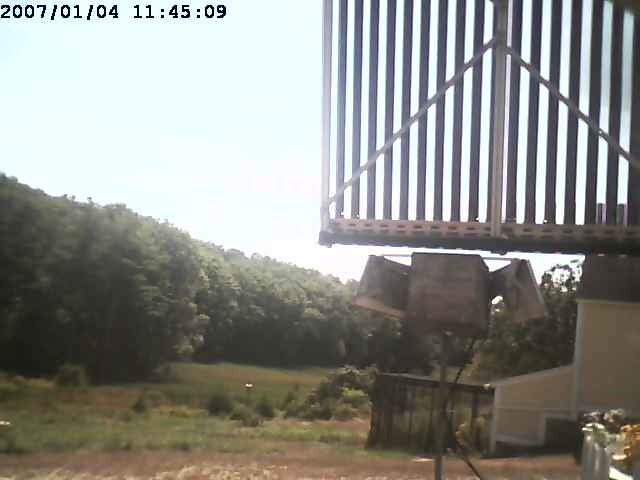 They also have the same performance in similar light conditions summer and winter. For a given absorber area, evacuated tubes can maintain their efficiency over a wide range of ambient temperatures and heating requirements. The absorber area only occupied about 50% of the collector panel on early designs, however this has changed as the technology has advanced to maximize the absorption area. 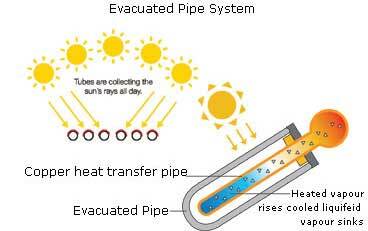 In extremely hot climates, flat-plate collectors will generally be a more cost-effective solution than evacuated tubes. When employed in arrays of 20 to 30 or more, the efficient but costly evacuated tube collectors have net benefit in winter and also give real advantage in the summer months. They are well suited to extremely cold ambient temperatures and work well in situations of consistently low-light.